To Avance I on the "Ships starting with A" page. Built by Københavns Flytedok og Skisbsværft, Copenhagen in 1912. According to the external page that I've linked to above, she was delivered in Jan. (Dec.? )-1912 as Avance to A/S D/S Activ (Th. Rasmussen's Sønner), Korsør. Owned from 1917 by A/S D/S Malin (H. Bach Nielsen), Korsør, no name change. From 1919, A/S Det Danske Kulkompani (Th. A. Svanholm), Cobenhagen, same name. From 1925, D/S A/S Imica (Jens Henriksen), Risør, renamed Avance I.
Nov. 22 Southend   OA 39 For Rouen. March 2 Southend   OA 102 For Rouen. June 15 Southend   OA 168 For Nantes. With OB 168, formed OG 34 June 17. June 17 OG 34 formed at sea Weymouth Bay June 21 OG 34 Put back due to German advance. Aug. 16 Methil Clyde  OA 200 Methil to Clyde. Probably to Lisbon, arrived Gib. Oct. 8. Febr. 13 Seaham* Southend Febr. 14 FS 724 *From Sunderland. Oct. 12* Southend Sunderland Oct. 13 FN 1148 *Page 9 gives departure Oct. 10. Most of these next 1944 voyages are not detailed on the archive documents and, therefore, comparison cannot be made and accuracy confirmed. Oct. 4 Barry Roads Seine Bay  EBC 123 Convoy available at link above. For information on voyages made in between those mentioned here, please see the documents received from the National Archives of Norway and A. Hague's Voyage Record above. Follow the convoy links provided for further details, several Norwegian ships took part. Avance I is listed as bound for Rouen in Convoy OA 39, which left Southend on Nov. 22-1939. According to A. Hague, she was detached from the convoy on Nov. 23 - see the external link provided in the above record. In Febr.-1940 she sailed in the Norway-U.K. Convoy HN 10, bound for Wisbech with timber, according to the original convoy document. Arnold Hague later has her, with destination Rouen, in Convoy OA 102, departing Southend on March 2-1940, dispersed March 5; Avance I had been detached from the convoy 2 days earlier in order to proceed to her destination. Again, follow the link provided in the table above - the Norwegian Rym is also listed. When war broke out in Norway on Apr. 9-1940, she was on her way from Seville to Glasgow - see Page 1 of the archive documents. As can be seen, she later made a voyage to Bordeaux and Verdon, before proceeding to Gibraltar, where she arrived on May 14/15. I now have her in station 53 of Convoy HG 30 to the U.K. on May 15. According to the convoy document, Avance I was bound for Portland on that occasion, cargo of iron ore. She arrived Weymouth Bay on May 24, Portland on the 29th. The following month she's listed in Convoy OA 168, together with the Norwegian Benwood, Fernbank, Ledaal, Nea, Svint and Topdalsfjord. This convoy left Southend on June 15 and joined up with OB 168 from Liverpool 2 days later, the combined convoy forming Convoy OG 34*, which arrived Gibraltar on June 24. 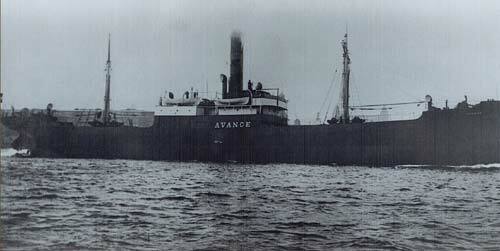 Avance I, however, bound for Nantes with coal, returned to the U.K. due to the German advance on France. She arrived Weymouth Bay on June 21, later continuing to London, where she arrived June 29 (judging from the archive document, it looks like she remained there for quite a long time). Again, see the external link provided in the table above (another section of the same site has also included Fernwood and Lysaker V in OA 168, but not Ledaal - Fernwood was in another part of the world at this time; here's her record for this time period. As for Lysaker V, I'm not sure whether she joined this convoy or not. She did leave Southend on June 15 and was also bound for France, but was diverted, according to her record. Checking Ledaal's record for this time, we see that she left Falmouth on June 18 and arrived New York July 7). In Aug.-1940 she's listed, together with Keret, in Convoy OA 200, which left Methil on Aug. 16; her voyage information is given as "Methil to Clyde". We later find her, with Ask, Fagerbro, Kongshaug, Libra, Ophir and Roy, in Convoy OG 42*, which departed Liverpool on Sept. 4 and arrived Gibraltar on the 16th - Arnold Hague indicates she may have been bound for Lisbon; from Page 1 we learn that she arrived Pomaron on Sept. 16, having sailed from Clyde on the 4th. All these ships returned to the U.K. with Convoy HG 45 from Gibraltar on Oct. 9; Avance I's destination is given as Methil and Kings Lynn, cargo of iron pyrites. Her 1941 voyages also start on Page 1 (it'll be noticed that she had long stay at Tyne at the turn of the year - occasional long stays in port are shown throughout her record) and continue on Page 2, Page 3 and Page 4. On July 20-1941 she was hit by a 500 pound bomb during an air attack outside Seaham Harbour, but it didn't explode, and she arrived port with the bomb still on board. She had 82 round trips through the so called "E-boat Alley" (an area between Hull and Boston, England where the E-boats were particularly bothersome, leaving a virtual graveyard of ships in their wake), transporting coal between Sunderland and London. Avance I witnessed an E-boat attack on the convoy she was in and saved 14 men from the British Firelight which had been torpedoed, but there's some disagreement as to the date of this attack, one source placing it on Nov. 2-1941, another in Nov.-1943. 4 ships were sunk. She took part in the invasion of Normandie, transporting bombs and ammunition to Omaha and Utah. According to "Nortraships flåte", she arrived Omaha Beach on June 15-1944. Arnold Hague lists her in Convoy EBC 9, which left Barry on June 11-1944 and arrived Seine Bay on the 15th. He has also included her in several other EBC convoys in this time period, as well as in returning FBC convoys - again, follow the links in the table above. * The OG convoys will be added to individual pages in my Convoys section in due course, along with more details on each; in the meantime, the ships sailing in them (and escorts) are named on the page listing ships in all OG convoys. This external page says she was owned from 1949 by Sadikzade Nazim Ogullari Muradiye Han, Istanbul, renamed Sadikzadenazim. From 1952, Sadikzade Nazim Ogullari Komandit Sirketi, Istanbul, same name. Left Zonguldak on Sept. 24-1954 for Istanbul with coal and disappeared with all on board. Back to Avance I on the "Ships starting with A" page. O. N. Henriksen & Jens Henriksen, Risør had a ship named Avance from 1954, originally delivered in 1945 as American Muscatine, 3914 gt. Sailed as Palma for J. Ludwig Mowinckels Rederi, Bergen from 1947, before being sold to Risør in 1954 and renamed Avance. Sold to owners in the Philippines in 1968 and renamed Duke Kl - broken up in 1972.